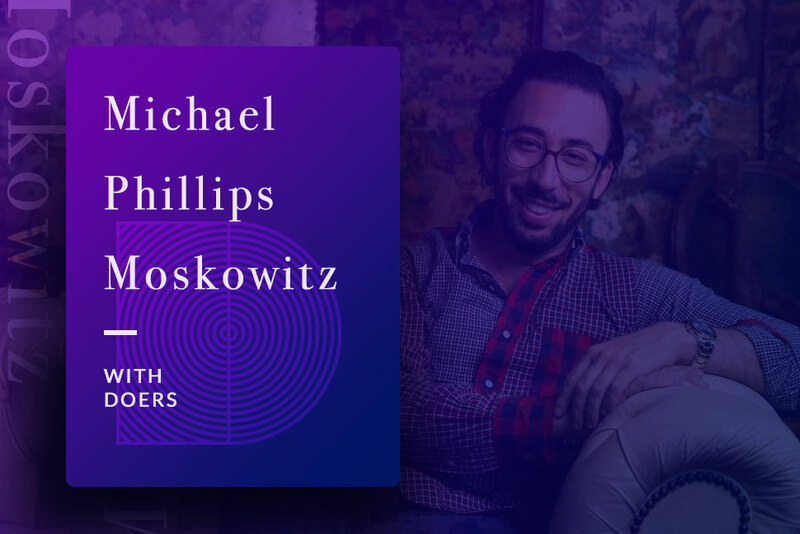 We’re excited to announce that Doers will be working with Michael Phillips Moskowitz for a secret project! Since we can’t really talk about the project, we decided to make a little interview. Michael Phillips Moskowitz is currently an Entrepreneurship Fellow at Harvard’s Kennedy School of Government. He was formerly an Executive-in-Residence at Foundation Capital, and eBay’s Global Chief Curator, a position created following the 2013 acquisition of the startup he founded, Bureau of Trade. I’ve dated altogether too many depressive or despressing varieties of “Francesca Woodman,” heavy quotes, to ever consider another go. Her, I’d lamentably have to kill her; boff: Emma Watson; marry: the Queen of England not for reasons of pure pragmatism, but because I’ve now or newwly developed an appreciation for the continuity of the crown. And worry that a post-Brexit U.K. may not renew my residency privileges. Q: What are you working on with Doers right now? It’s still steeped in secrecy, but I what little I can reveal concerns the potential and kinetic energy of written and spoken language. We’re labouring to codify and more intelligently dimensionalize “tongues,” new and old. Doers, largely on account of Julien, whose electrifying talent makes alternative agencies pale and seem frail by comparison. Q: What’s been good about working with Doers so far? Certainly not the relative state of cleanliness in the war room. Q: Whats been really good about working with Doers so far? The irrepressible sense of optimism, and sheer determination to deliver a superlative product. Q: Who’d win in a cage fight between you and our creative director, Julien? Nicholas Cage. Somehow, he’d end up in the ring–like he does in every other dreadful exercise in or on film. Q: After a full day of working with us, what do you think you bring home with you at the end of the day? A renewed determination to zealously pursue my dream(s). Q: Finally, whats your number one advice for someone who wants to make it [professionally] in this world? Tenacity and pathological determination to win always outweighs talent and passion. But we all need lady luck to intervene on occasion and shine her resplendent countenance.